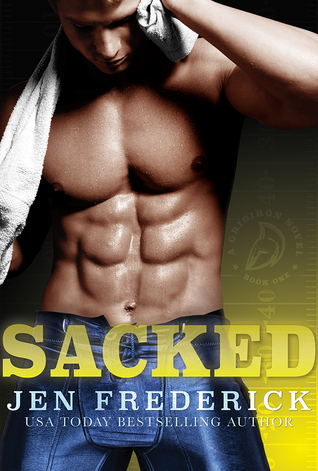 ➦This is a stand alone new adult sports romance novel, first in the Gridiron series. Where does that term come from anyways? “Gridiron” is a reference to the design and shape of the lines on the field of play, which resemble that of a gridiron – a grid-shaped metal grate used for cooking (like those found on a grill). ➦So… A VIRGIN star college football player for a hero? Um, yes please! If you think you’d find this to be an aphrodisiac… then by all means… have a read, would ya? ➦I should perhaps mention that Knox has an identical twin and has a bit of a complex when it comes to girls not being able to tell them apart. ❤The first half of the book was HOT! I loved the anticipation and a little back and forth the MCs had going. Ellie, the heroine, was against dating a football player so Knox had some convincing to do. ➦The hero experiences a case of insta-love and repeatedly declares Ellie to be “the one.” I’ts cute, really. I could have totally overlooked everything if it wasn’t for a totally predictable and cheesy ending >.< But oh well, liked it non the less! ➦Recommended for those who enjoy sports romances, college scene, a bit of drama and cheesy sprinkles on top. Oh! One last thing I have to include! Our hero goes to work out and sees his buddy doing deadlifts. He then decides to spot him.